November Monday 17th and Tuesday 18th at ACROE in Grenoble took place the first atelier of the project Art de la scène et numérique (Performing art and digital technology) part of the european project Alcotra: Acteurs Transculturels. (Cross Cultural Actors) : http://www.cedra05.fr. The project has as its objectives to support and encourage the artistic practice with artists in fields of music and dance coming from partner territories of the project (Hautes-Halpes, France and Piedmont, Italy), with the aim of overtaking the geographical and thematic borders between various modes of artistic expression. The artist involved are Isabelle Mazuel (living in Mont Dauphine), choreographer and dancer (and the musicians (composers and performers of instrumental and electronic music) David Bonnefoux (Gap), Simone Longo (Cuneo) and Mario Valsania (Montà d'Alba). The group, coordinated by Giuseppe Gavazza (composer, PhD Student at ACROE and teacher at Cuneo Music Conservatory) will work till end of February 2015 on a collaborative creative artistic project that will be defined in the details throughout a remote continuous workshop and meetings in December and January to prepare the public presentation of state of the art of the projects at the end of February 2015, probably in Grenoble and/or in Gap and/or in Cuneo. Scroll down for artists informations. Isabelle Bazin Mazuel : dancer, choreographer, teacher of contemporary dance, artistic director of the festival Vetical'été. As a choreographer, I have often matched the use of video with the creation of live music; it appears that the image usually brings a close introspective dimension. The themes are devoted to encounters and inward universes. the human and the dancer, are individuals in the middle of a whole but are also components of it. This is where inwardness and hugeness are confronted and make sense. David Bonnefoux : French musician, composer and producer. Holds an Electroacoustic composition prize in the class of Bernard FORT (E.N.M. Villeurbanne) and a D.E.A. in musicology (Université Lumière Lyon 2). 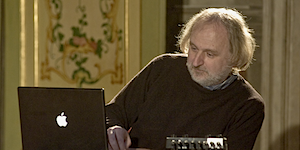 His catalog of works includes many musical compositions "acousmatic" [music for choreography, storytelling (edition GMVL Lyon), exhibitions ...]. In addition, he has directed many Rap and electronic music projects. Simone Longo is an Italian artist focused on sound research and multimedia arts. He studied electroacustic composition at “G.F.Ghedini” conservatory of Cuneo. “L'intesa e la tramutazione, baloccavano insieme a Cana” e “ Fattori nominanti e minuti dettagli” are some among his electronic multi-channel compositions. Among his sound installations works: “Alice sound machine”, “The beat carpet” e “Fragmenti micro”. He work and cooperate with the studio of sound design and mastering “Soluxion Lab” based in Berlin, for which it has developed “Contact dark tablet” an midi controller and instrument for live electronics interfaced with Ableton Live. He is Co-founder and member of Bande Critiche Laptop Ensemble, an improvisation ensemble composed by six electronic musicians. In 2014 he released “Floating blooms Ep” on the german label Soluxion records. Mario Valsania brilliantly graduates from the Conservatorio of Alessandria in Composition, in Flute from the Conservatorio of Brescia and in music teaching from the Conservatorio of Cuneo. Furthermore he continued his specialization studies on Flute with G. Pretto from the “Perosi” school in Biella. He deepened his Composition knowledge with A.Corghi from the Fondazione Romanini of Brescia. He attended master class with Paul Glass from the Conservatorio of Lugano. His works have been executed in many festivals obtaining flattering success (Piemonte in Musica, Antidogma Musica). Part of his production is specifically dedicated to pupils at their first approach to the instrument. He is awarded of the national competition “P. Rossi” for children choir. As flautist, he performed in several chamber music groups from the ethnic repertoire to the contemporary one. He is Flute teacher in schools and music institutions. He publishes for De Haske Edition, Edizioni Musica Practica.